Powers/Abilities/Functions: The first three Sleeper robots were built by the Nazi Third Reich as a way to avenge its defeat years later. These three robots were designed to operate independently and then to link up with each other and combine their powers. 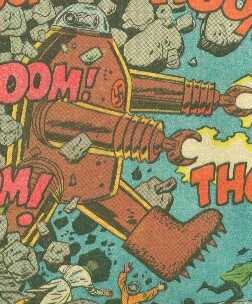 First Sleeper - A walking juggernaut, the first Sleeper could easily smash through structures, could survive a landslide, and could fire destructive electric-bolt force rays from its hand-electrodes. Second Sleeper - A flying batwing aircraft, the second Sleeper emitted a tractor beam-like force which could uproot trees and tear the walls out of houses. Third Sleeper - The "brain" of the grouping, the skull-shaped third Sleeper flew via high-pressure air-fans, and housed a powerful bomb. (Captain America Annual#13) - In April of 1945, in Adolf Hitler's underground bunker, in the besieged heart of a mortally-wounded Third Reich, Hitler discussed with Red Skull the impending defeat of the Third Reich and "der Tag," a scheme for revenge that included the five Sleepers. Hitler entrusted a strongbox to the Red Skull. Red Skull relocated with Hitler's strongbox to his bunker which was invaded by Captain America, Patriot, Spirit of '76 and Red Guardian. (Tales of Suspense I#72 (fb) /Captain America Annual#13 (fb)) - In 1945, during an Allied bombing raid on Germany, Captain America confronted the Red Skull in a hidden bunker. The Skull told Cap that even though the Nazi regime was doomed to fall, the Third Reich would be reborn on "Der Tag" ("The Day"), when three Nazi agents would begin to release the Sleepers that were hidden in Germany. Captain America managed to grab a strongbox containing information on the Nazi agents just as a bomb completely buried the Red Skull's bunker (see comments). (Captain America Annual#13 (fb) ) - A bomb completely buried the Red Skull's bunker and the strongbox was lost in the rubble. 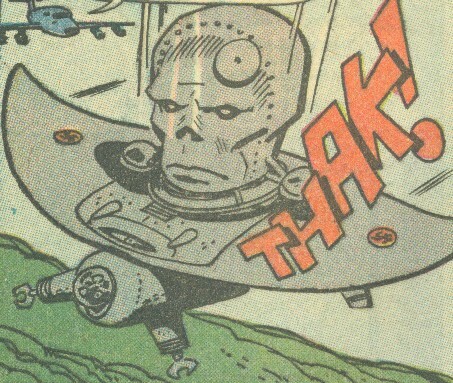 Years later it was found and the Communist Red Skull eventually acquired it. (Tales of Suspense I#72) - When "Der Tag" arrived, Agent 1 (Martinus von Kimmer) and a band of men released the first Sleeper from a cave near Bavaria. 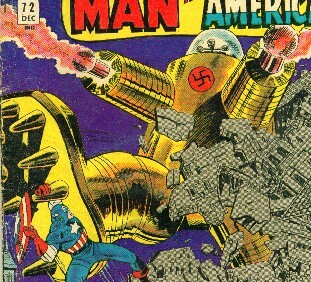 The robot went on a rampage across the countryside of Gortmund as Captain America went to investigate. (Tales of Suspense I#73) - Agent 2 (Kerta Wolfmann) and a team of diggers released the second Sleeper from the pit that it had been buried in. The second Sleeper caused a path of destruction through Telbeck, then went to rendezvous with the first Sleeper. The two Sleepers linked up and combined their powers. (Tales of Suspense I#74) - As the two Sleepers battled with NATO forces and continued their wave of devastation, Agent 3 (Lars Schlag) released the third Sleeper in Molnitz, which linked up with the other two, and the combination of all three Sleepers continued on a northward course. 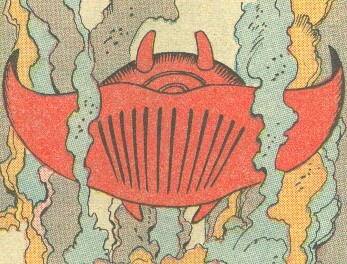 Captain America theorized that the combined Sleepers would fly to the North Pole, and go into a death dive with the first Sleeper blasting a path virtually down to the Earth's core; he further hypothesized that the interior heat of the Earth would cause the bomb in the third Sleeper to ignite, setting off an endless chain of thermal explosions which would tear apart the planet. Jumping out of a pursuing plane, Captain America used a flame-thrower to set off the bomb in the third Sleeper, destroying all three Sleepers in the process. (Captain America I#370) - Human-sized replicas of the first three Sleepers (alongside the fourth and fifth) were kept in the Red Skull's trophy room at Skullhouse. When Captain America and Diamondback invaded Skullhouse in search of the Red Skull, Machinesmith activated the replicas to battle them, but all three duplicates were easily destroyed by the duo. Comments: Created by Stan Lee, Jack Kirby, and George Tuska. All references to the Sleepers being activated "twenty years after the War" from the original stories are topical. The first three Sleepers would later be followed by Sleeper 4 (a "living volcano", later utilized by the Machinesmith) and Sleeper 5 (a walking juggernaut that sprayed poison gas). Purely speculative, but given the fact that Hitler was still "alive" at the time (see the Hate-Monger), the actual purpose of the Sleepers may not have been to destroy the world. Perhaps all five were meant to be activated simultaneously to mount an attack on Allied forces and cause world-wide havoc while Hitler amassed an army (possibly utilizing the Death's Head Satellite (the Sixth Sleeper?)) to establish a Fourth Reich; but thankfully, Captain America's timely intervention threw a monkey wrench into the machinations of the mad fuehrer. One small temporal discrepancy from Saga of the Original Human Torch#2. That story has a scene at which the Invaders are told that President Roosevelt had died that morning. Colonel Farrow then assigned Captain America and Bucky to guard a top-secret drone plane at the airbase just south of London, and later told the Human Torch and Toro that he had a few minor missions for them and then, in a week or so, they would be going to Berlin to try to capture Adolf Hitler alive. Since FDR died on April 12th and the Berlin mission didn't take place until April 30th, there was obviously a greater delay than Farrow had anticipated. Also, the story in Captain America Annual#13 depicts Cap's mission to invade the Red Skull's bunker and retrieve Hitler's top-secret strongbox. During that mission, Cap mentions that the Human Torch and Toro are (or will be) handling the invasion of Hitler's bunker. Later, once his mission is completed, Cap mentions that he and Bucky "have to guard an airdrome back in England." If Cap's mission took place on the same night as (or just before) the Human Torch's mission, then he was only BACK guarding the drone plane for a few days before his fateful encounter with Baron Zemo (who had been sent to Britain by the Red Skull before the Skull's apparent death). It turned out Tara was one of the Red Skull's Sleepers who was designed to activate in the presence of the original Invaders (Cap, Torch, and Namor). And when Cap turned up to put the kibosh on the USAgent (who had ditched the Judge Dredd rig he was wearing in Maximum Security in favor of a modified Cap suit), Tara turned into a big bomb. In Captain America I#148 the Red Skull revealed (and I quote) �the fifth and final Sleeper.� Do I remember them from TOS? Back in WWII, during their last battle, the Skull warned Captain America of three Sleepers� not six, three. The first three assembled their component parts, and on Earth-J, that counts as �one.� (The Skull �changed the numbering� in order to take Cap by surprise at a later date (Captain America I#101 and #148). If you buy that, the �fourth Sleeper� was actually the second and the �fifth Sleeper� was actually the third, but now there�s another one!? 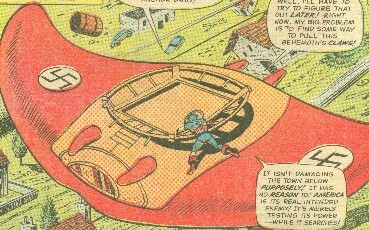 In the original version, Cap evidently removed the strongbox and took it with him. Decades later, he pulled out and opened the box, which he somehow had kept, revealing the contents to be the plans for the unleashing of the Sleepers. In Captain America Annual#13 Cap did not leave with the box, but rather, it is the subject of a decades-long hunt. The contents of the box are also revealed to be something altogether different -- that is, personal mementoes from Hitler's early life. It seems that the second version of the Hitler strongbox story was necessary in order to negate the problems associated with the original version. It doesn't make much sense that Cap could have kept the box "all these years" when, in fact, he was frozen only days after his battle with the Red Skull and for decades he lay in a frozen tomb. Cap did manage to locate some personal belongings from his war years, sometime soon after his modern-day resurrection, however. In Tales of Suspense I#75, he is shown longingly looking at a photograph of his first love, the woman later identified as Peggy Carter. One could argue that the strongbox was kept with this photograph and other memorabilia during the lost years. Years after his return, Cap was also able to retrieve an old army footlocker, which contained a number of other personal belongings from the war, including his original shield and his war journal. This was shown in Captain America I#246. If, in fact, the strongbox was not in Captain America's possession during this time, then some other explanation would have to be made to explain the box shown in the first Sleeper story in Tales of Suspense. 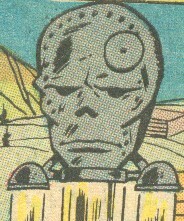 Hitler and Red Skull first discussed five Sleepers in the Annual. When Cap and the Skull met, the villain only mentioned three Sleepers. All Nazi Sleepers including these 3 received an entry in the All-New Official Handbook of the Marvel Universe Update#2. First names for Schlag, von Kimmer and Wolfmann were revealed in the updated Sleepers profile in OHotMU A-Z HC#10.